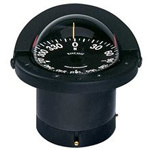 Explorer Compass Features - 2 3/4" Easy to Read Direct Reading Dial - Easily Installed, Fits 3" Instrument Hole - Bezels Styled to Match Popular Gauge Packages - Viewing is adjustable to 30 degrees - Choice of Traditional Black or Designer White Colors - Scientifically Matched Sapphire Jewel & Hardened Steel Pivot Dial Movement - Exclusive Built-in NiteVu Lighting - Built-in Compensators to Easily Adjust for Deviation - Hi-Temperature Construction - 100% Repairable - Exclusive 5-Year Warranty - Approx. 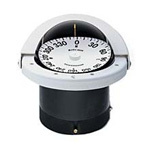 Shipping Weight: - 1 lb (454g) - Replacement Parts - Light Assembly: EX-0057-2 - - Notes: - All compasses come standard with 12 volt lighting. 24 volt lighting option is available.